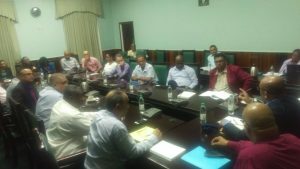 Representatives of Guyana’s private sector meeting with Opposition Leader, Bharrat Jagdeo and other PPP parliamentarians at Parliament Building. Opposition Leader, Bharrat Jagdeo on Thursday floated the likelihood of legal action if the Guyana Revenue Authority (GRA) is empowered to garnish persons’ bank accounts or block them from travelling if they owe taxes. Finance Minister Winston Jordan during his 2017 budget speech on Monday in the National Assembly proposed an amendment to Section 45 of the Value Added Tax (VAT) Act which required a court order in order to block persons from leaving Guyana once they owed money to the tax collecting agency. Minister Jordan also proposed an amendment to Section 102 of the Income Tax Act in order to grant that agency the new power of dipping into taxpayers’ personal bank accounts once they owe the agency. “This provision would assist to improve compliance with demands issued by the GRA for outstanding payments,” Jordan said in his budget speech. Jagdeo said there other other measures to settle tax liabilities including bargaining, and court proceedings which afford the taxpayer an opportunity to respond fairly in court. “You can’t say ‘OK, we assess you and believe you owe this’, and then behind their back go into their account and take their money or stop them from going out the country,” he added. Jagdeo’s’ meeting with the private sector this morning was part of a two-day consultation with the public in appointing the next chairperson of the Guyana Elections Commission. The former Guyanese leader met yesterday with the Guyana Trade Union Congress (GTUC). Though he did not divulge much on that meeting, he did say, the GTUC agreed to keep in touch with the Opposition on mutual issues of interest to both sides. Jagdeo expects a list of 200 or so persons by the end of the consultations, which will later be narrowed down to 6 nominees to be submitted to President David Granger for his consideration. Jagdeo anticipates the six nominees will be presented by the end of this year. Dr. Steve Surujbally has already tendered his resignation with effect from November 30, 2016, ending a 15-year tenure at the helm of the elections management authority.